Posted April 18, 2018 by Seán Kinane & filed under Economy, Health care, News and Public Affairs, Taxes. A new report put out by progressive organizations finds that many low- and middle-income Floridians will be harmed by the one-two punch of the new federal tax law and the recently signed state budget. In a conference call with reporters today, Debbie King with Organize Florida warned that the Trump tax cuts will likely lead to deep cuts in social services. “On this Tax Day, health care and other vital public services are much less secure for Florida and working families due to those $1.5 trillion in tax cuts enacted by President Trump last year. The tax cuts take revenue out of the federal budget that could be used for public services and investments and divert most of it to the richest households and largest corporations. When the new tax law is fully phased in, 83% of the tax cuts will go to the wealthiest 1%. Moreover, these tax cuts will explode the national debt and thereby endanger future funding for Medicare, Medicaid, Social Security and other public services that working families rely on. The new report from Americans for Tax Fairness and Health Care for America Now! is about how Floridians will be hurt by President Donald Trump’s tax cuts and Governor Rick Scott’s state budget. Mona Managat, a physician practicing in Pinellas County who is also a member of Doctors for America. 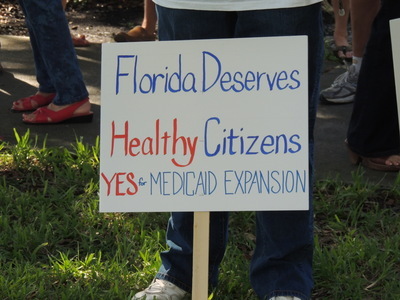 said a quarter of her patients are Medicaid recipients and they’ll be devastated by a new Florida law that gets rid of RME, or retroactive Medicaid eligibility. But it’s not just state policy that’s harming poor people. Bruce Nissen is a retired labor studies professor critical of President Trump’s tax cut.